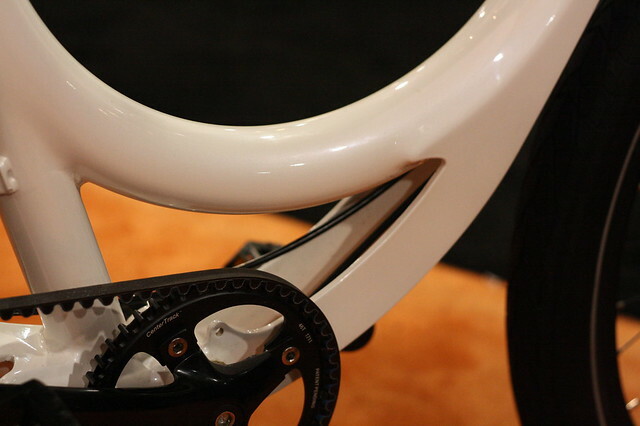 I met up with Urbana Bicycles at the NuVinci booth to check out their redesigned bike. First thing they added was a NuVinci hub. Then they beautified their frame by smoothing out the welds. Their famous RNR rack is still on the Urbana, by the way, this rack is rated to carry heavy objects, as much as an adult. 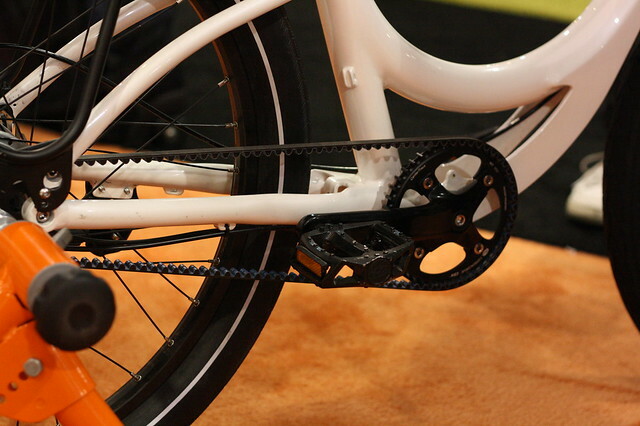 They outdid themselves by going with the reliable Gates Belt Drive. 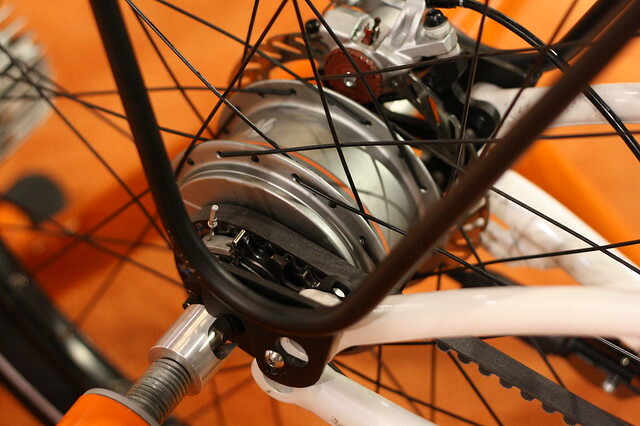 The rear drop out had to be redesigned to make the belt drive serviceable. I noticed something on the frame and I asked what it was supposed to be. Turns out they’re working on a front rack that connects to the frame. 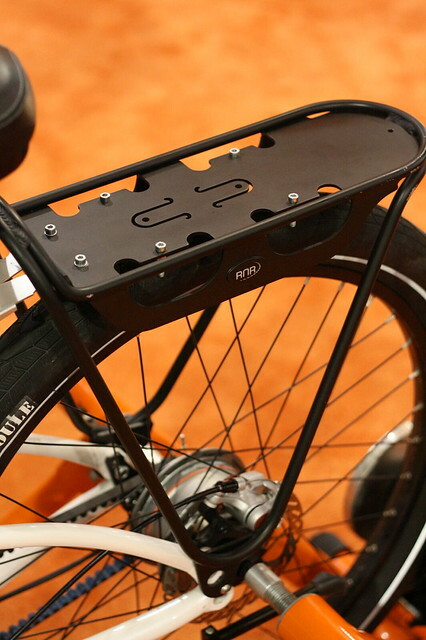 Unlike most front racks that are connected to the fork, this design promises to be more stable. Another thing I noticed was the bike itself looked shorter. Turns out the Urbana engineers tweaked the head tube angle and brought it in closer. 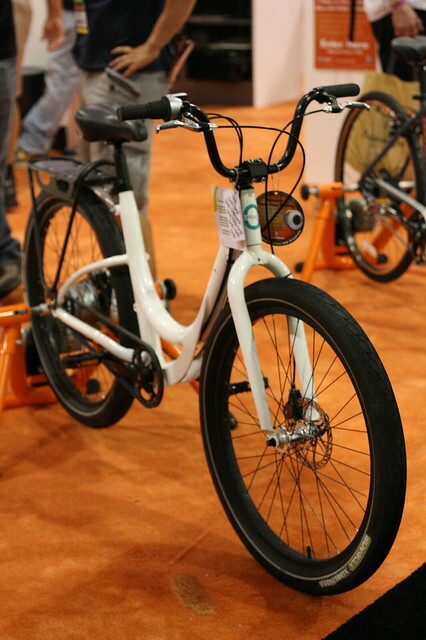 I forget the exact numbers, but the shorter wheel base will help the Urbana become more nimble and easier to handle. Looks interesting. Those are some monster-fat tires. What kind of seat comes standard on that Urbana, RL? I’ll find out for you. Mr. Dottie (spouse of one of the LGRAB duo) just got a belt driven bike. I’m curious about the durability of such a system in the winter (and ice/snow). Kind of disappointed in no fenders. But I’d love to try it… assuming it’s not too hefty. I would love to see more bikes with the front rack mounted to the frame. Sounds like a winner all around. I have a say it’s looks a little naked without fenders. The drivetrain is really in the line of fire for any debris kicked up by the front tires. I haven’t seen any winter reports, but I would think a belt-drive is superior in cold weather…no shifty bits to clog up with slush, no worries about road salt attacking the chain. And, if a similar belt can handle 100+ horsepower on a motorcycle, the output of our puny legs (by comparison) should be no match for the Gates drive. great. the kind of innovation i like to see. about the only thing my breezer uptown infinity doesn’t have is a gates belt. time for a belt breaker. 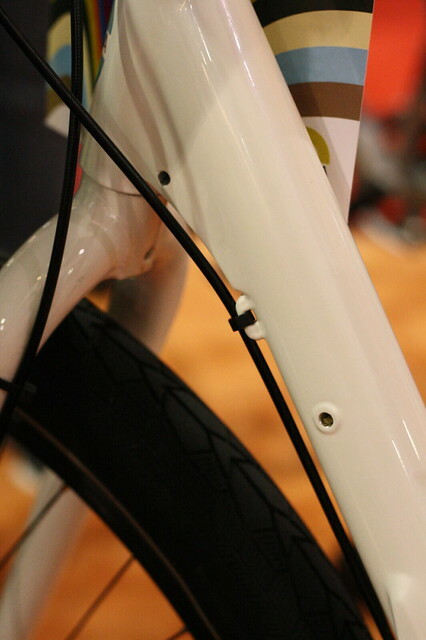 and the possibility of a frame mounted front rack is intriguing. back in my touring days, i put the weight up front. There was another comment about belt-drives. We have tested the original belt here in Canada. For Wet weather in the city…Belt is great since its dosent need re-lubrification.??? (not sure if this is a real word but you get the point). However, when fine dirt piles up in the teeth, that greatly increases the tension of the belt. When there is too much tension on the belt, there is too much pressure in the crank and hub bearing…..and that could damage the hub bearing…..although that has never happened to us. Dirt should be easily removable from the belt…just hose it off and go. That’s WAY better than washing, degreasing and re-lubing a chain. “Urethane shock absorbers.” Interesting. My experience with those foams is that they break down and collapse pretty quickly, so my only reservation would be the longevity of the saddle. The dust in Phoenix is really a fine grit, so I’ll bet a belt drive would be ideal: as the belt flexes it would shed the dirt. None of my rides have fenders (the most roadway water I’ve ever run into is when a construction crew was purging/sanitizing a new waterline via a fire hydrant), so I think fenders are an unnecessary option for me. Urethane is the same stuff skateboard wheels and body-suspension mounts for racecars are made of…the stuff doesn’t break down the way rubber does. You’re probably right, GR. I was thinking of the lighter foam products … the stuff with the density not much greater than Styrofoam. I think it’s a tried-and-true solution…there are several saddles on the market with elastomer dampers where the rails attach to the saddle shell. Gotta say that I like the idea of urethane parts rather than creaky bedsprings! Elizabeth asked about belt drives for winter use. Gates is known for their *snowmobile* drive belts. They also make motorcycle belt drives, automotive engine belts, and industrial power transmission belts. The engine belts are supposed to be replaced every 50,000 miles. 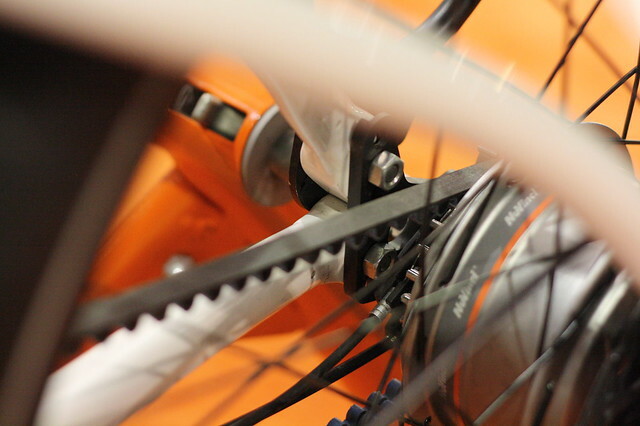 The bike drive belts are a piece of cake compared to any of those other applications. The Gates people are in Denver and many of them are avid year round bike riders. 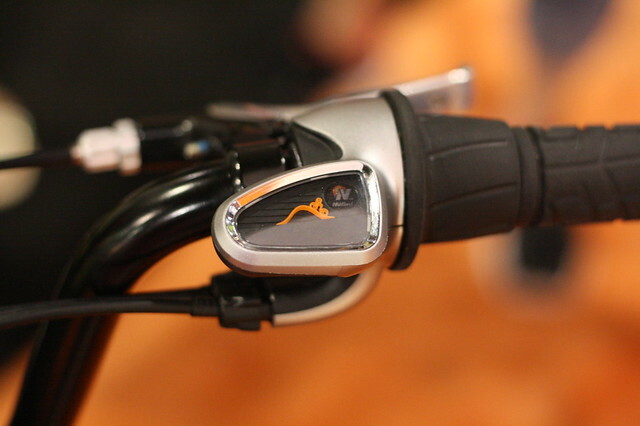 I’ll be testing this bicycle in the winter through the salt, slush and snow. Not sure if it will have a belt drive but I hope it does. I’ll post my findings on my site. I’ll be searching for some serious potholes.